So, horror of all horrors, the dishwasher broke! And to make matters worse it was after a dinner party and we had used every plate, bowl, fork and knife in the place! So, the hunt was on for a new dishwasher and in this I learnt some new Chemistry and am now incorporating my dishwasher antics into my GCSE teaching! Cue the cheeky starter of my broken dishwasher asking students to suggest what happened. 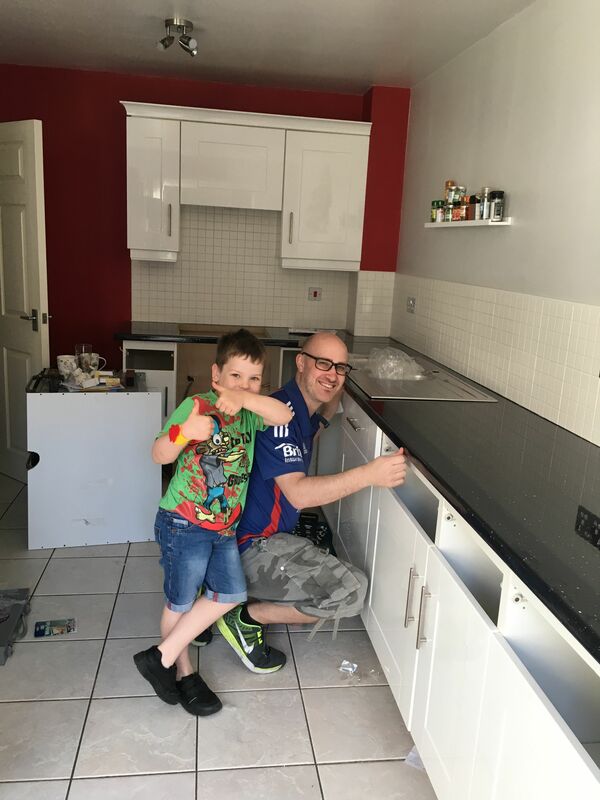 My partner and son get to work with fitting a new dishwasher! I have NEVER added dishwasher salt to my dishwasher – this has caused a little bit of blame fired at me for the fiasco of last weekend. So, I took it upon myself to understand why we add the salt. Firstly, I understand that salt is a very general term in chemistry, it is a neutral compound made when the hydrogen ions in an acid have been exchanged for a metal ion or ammonium ion. So, firstly I needed to find out what salt dishwasher salt is. It is in fact sodium chloride (students can then draw the lattice structure of this compound). As I live in the Midlands, we have hard water piped to our homes. To improve the energy efficiency of the dishwasher it is important that only soft water is used. This allows me to ask students to draw the dot and cross diagrams of the ions that make water hard (calcium and magnesium ions). This is because hard water causes limescale (calcium carbonate) to form on the heating element, requiring more electricity to heat the water. 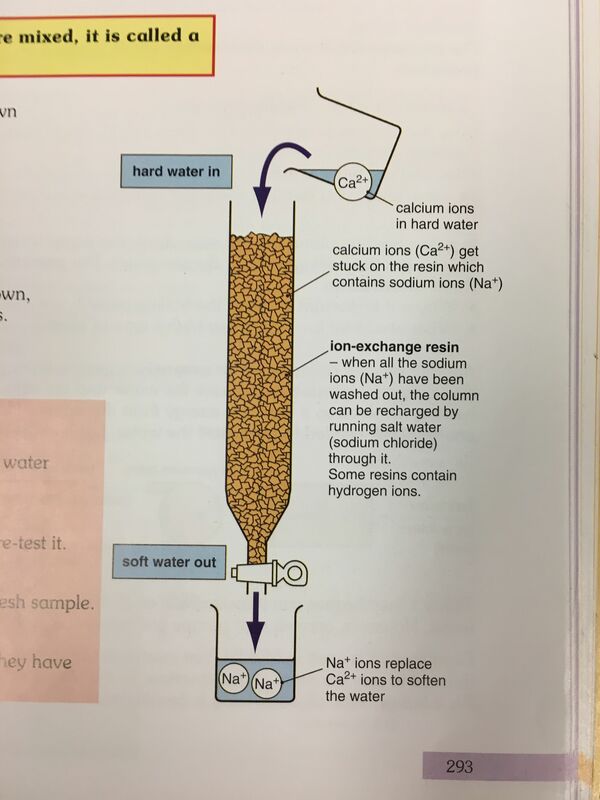 So, I can ask students to define the bonding in limescale (ionic) and use this to predict the melting point (high as a lot of very strong ionic bonds must be broken to melt the substance). If your students are preparing for C3.2.1 AQA Chemistry GCSE for this summer exams, you can also consider why sodium chloride is added at all. The dishwasher has an ion exchange column used to soften the water, this means that the calcium and magnesium ions are replaced by sodium ions in the resin. To re-generated by washing through saturated solutions of brine, hence the need for dishwasher salt. In Europe ion exchange columns are often an internal part of a dishwasher. The next question surely has to be, can I just use normal table salt then as it is the fraction of the cost of dishwasher salt. Sadly, you can’t; table salt contains anticaking agents to stop the grains of salt sticking together and often contain magnesium and hence cannot regenerate the resin. So, the next time you load up your dishwasher, just remember all the chemistry that is going on and don’t forget to use the salt! Sam Holyman is Junior Science Co-ordinator at Bablake School in Coventry, and West Midlands ASE President. She is also author of a number of best-selling science textbooks for KS3 and GCSE, and a keen advocate of innovative teaching and learning. She was recently nominated in the Teacher Scientist category for the Science Council’s 100 leading practicing scientists in 2015.